I've had a fascination with public speaking for some time and have been a member of the Oracle Toastmasters team for the past couple of years. I decided to throw my hat in the ring for the local area international speech competition and was fortunate enough to win and advance to the district contest in a couple of weeks. On Saturday morning, we went to see my old Oracle buddy, Orlando Mazzolini along with his daughter and brother in law as they raised money for a local charity. Billy runs Laker Outfitters the Under Armor dealer in Prior Lake and they were selling a bunch of cool merchandise for a great cause. They're such good people. Ten-year-old Sanya Pirani has spent the last three years organizing donation drives for various charities in the metro area. You can read about her here. She's a pretty impressive young lady and has collected more than 13,000 diapers for needy families. Very inspiring. On Saturday, Uncle Jerry and Grandma Leona came to town for a visit. We went to Outback and had a darned good time. 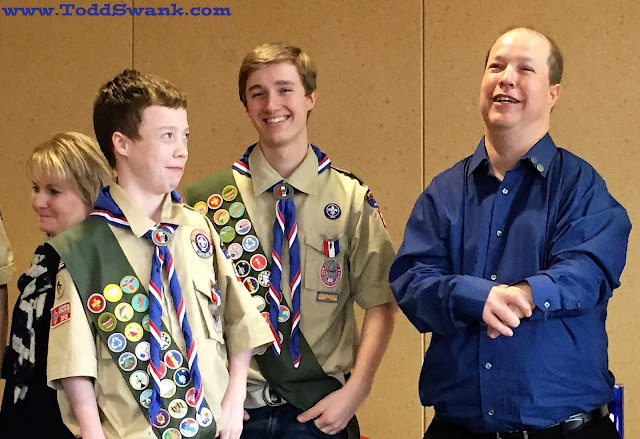 The reason they came to town was to help us celebrate Luke & Avery's Eagle Scout Court of Honor. We were very happy they were able to attend. Luke and Avery celebrated their achievement of earning the rank of Eagle Scout with two other fine young men, Parker Jorenby and Adam Fowler. We were very fortunate to be able to share this honor with two great families. We have known the Fowlers for several years now and spend a lot of time together for Scouts and Robotics. We really got to know one another the past couple of months while spending many hours together preparing for this event. Parker is a year younger than Luke and Avery, but he is an over achiever who could have earned his rank of Eagle several years ago if he would have chosen to do so. Lucky for us, he timed it the way he did and allowed us to celebrate the event together. Chuck and Clarice are very involved in Boy Scouts so their input was quite valuable for planning of the actual ceremony. There was a time where I never thought it possible that our boys would stick with scouting long enough to attain eagle scout status, but they continue to amaze and inspire us every day. Miss Sheri and I are very proud of these boys. We were excited to have Grandma Linda and her good friend, Mike, join us for the ceremony. Prior Lake Mayor Kirt Briggs was kind enough to attend and spoke during the court of honor. His words were inspiring and made me feel like we've got a great guy in charge of our home town. Minnesota State Representative, Drew Christensen, also spoke at the event and informed us that he created a House resolution congratulating the boys for receiving their Eagle Awards. We thought that was extremely cool! We had several community leaders in attendance including our old friend and Scott County Commissioner, Tom Wolf. He was kind enough to help present the Eagle jackets that were given to them by the Lions. We were blessed to have so many wonderful scouts in attendance with us to celebrate the occasion. The ceremony had a lot of speaking parts, so the boys thought it would be a good idea to rehearse their lines before things began. We created this video featuring pictures of the Boys' scouting adventures over the years and played it before the ceremony. We held the event at the Savage Environmental Learning Center and it was getting filled to capacity before we started. Before we knew it, the clock struck two and it was time for the ceremony to begin. The Troop is boy led as much as it can be and we had several great young men help lead the ceremony. Eventually the boys recited the Eagle Oath and their designation was official. They bestowed Miss Sheri and I with Eagle parent pins and we repaid them the favor by helping them put on their new eagle neckerchiefs. They received some pretty nice red jackets from the local chapter of the Lions to commemorate the occasion. Each of the boys paid honor to mentors who helped them earn their achievements. Troy Brown was with both Luke and Avery from the beginning. He was recruiting Cub Scouts back when we were in the first grade and looking for a Pack to join and he was with both of them as they attended their Eagle Certification meetings. Pretty cool for him to be with them throughout the entire process. Our neighbor, Jim, was also very helpful to both of our sons when they completed their required Eagle projects. Lisa Maldonado has been a mentor for the boys in robotics and was instrumental in helping them come up with the ideas for their eagle projects. We certainly appreciate all the help she has provided them. We had lots of friends in attendance to us help us celebrate the occasion. It was a whirlwind of activity and I wish we would have had more time to talk with everyone who was kind enough to attend, but we certainly enjoyed the time we had. 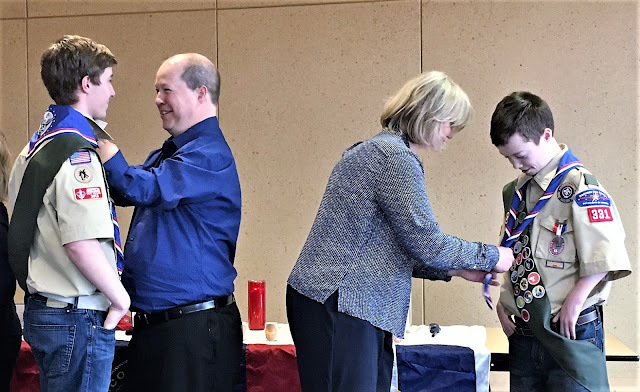 My Oracle co-worker, Aaron Symicek, attended with his son who just recently crossed over from Cub Scouts to Boy Scouts and was excited to be there. I'm glad they had the chance to join us. One of Chuck and Clarice's friends was kind enough to make us this incredible cake for the occasion. Unfortunately, I was too busy taking pictures to even have a piece of it. Sure looks tasty, though.